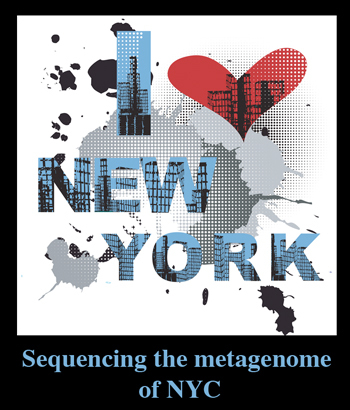 Cash and Sewage, Sequencing the metagenome of NYC – microBEnet: the microbiology of the Built Environment network. Professor Jane Carlton, the director of the NYU Center for Genomics and Systems Biology, is leading a team of scientists to study the metagenome of New York City. They have begun a pilot study of the microbial populations on one dollar bills, and they have begun to sample different sewage lines in all five boroughs. In an interview conducted by In Sequence, Professor Carlton discusses the project (towards the end of the interview) as well as the organization of New York University’s Center for Genomics and Systems Biology’s GenCore sequencing facility and the role of sequencing in faculty research. An announcement of the winners of NYU’s “Grand Challenge” science competition describes the potential benefits of this project which include; identifying potential bio-threats, predicting flu epidemics, and gauging the impact on the city’s metagenome of events such as Hurricane Sandy. For more information there is a short video about the project here.